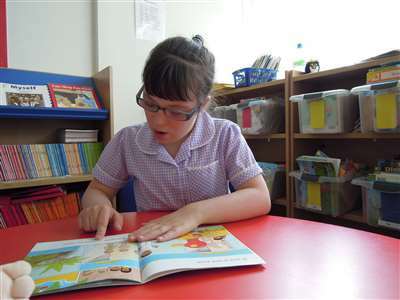 Using a case study of integration into a mainstream primary school for his daughter with Down syndrome, the author seeks to explore the attitudinal development of her mainstream peers after a four-year period. As such, it is a first step, tentative piece of research, fraught with potential pitfalls. As Bines (1995) points out as a 'researcher [I am] inevitably part of the phenomenon being studied'. Through scripts written by children aged 7-8 years about Katie, their peer with Down syndrome, an analysis of the children's perceptions of and attitudes towards Katie was undertaken. The findings reveal significant insights on the part of the children, and an appreciation of the child for her abilities, not her disability. The outcomes of the research are interpreted in terms of family empowerment within a community, following a positive period of interaction for the child with Down syndrome in a neighbourhood mainstream school setting. A new paradigm, worthy of further exploration, is that of 'parent as researcher'. Carpenter, B. (1995) Tell me about Katie - Attitudes of mainstream 7-8 year olds to a peer with Down syndrome. Down Syndrome Research and Practice, 3(2), 45-52. Few studies have centred on the reactions of fathers to the births of children with special needs, the majority have reported mothers' responses and their perceptions of the fathers' reactions and needs. Literature on the subject is sparse. This paper reports two studies which focused on the parents of ten pre-school children with Down syndrome. These studies explored mothers' and fathers' responses to (i) the disclosure of diagnosis and (ii) the events during the six months following disclosure. Study 1 involves the mothers of these children and study 2 was carried out with the fathers of seven of these children. The studies were carried out by semi-structured personal interviews. Some of the key issues raised by the fathers were the ways in which the diagnosis was disclosed, the initial and ongoing access and availability of professionals, the focus of services on mothers and children, their inability to discuss their feelings with their partners and their role as supporter. Herbert, E. (1995) Parents' reported responses to the disclosure of Down syndrome. Down Syndrome Research and Practice, 3(2), 39-44. Van Dyke, D, McBrien, D, and Sherbondy, A. (1995) Issues of sexuality in Down syndrome. Down Syndrome Research and Practice, 3(2), 65-69. Byrne, A, Buckley, S, MacDonald, J, and Bird, G. (1995) Investigating the literacy, language and memory skills of children with Down syndrome. Down Syndrome Research and Practice, 3(2), 53-58. This paper reports evidence for the importance of reading instruction for memory and language development in children with Down syndrome. Language and memory measures for 14 children were obtained over nearly four years as part of our research investigating the effect of teaching memory strategies. Half of the children were readers or became readers in the course of the study. At the start of the study, there were no significant differences between readers and non-readers in vocabulary and grammar understanding, or in auditory and visual memory performance. By the end of the study, a significant advantage for the readers was noted for all language and memory measures. Possible reasons for these findings are discussed, as well as the implications for educational intervention. Laws, G, Buckley, S, MacDonald, J, and Broadley, I. (1995) The influence of reading instruction on language and memory development in children with Down syndrome. Down Syndrome Research and Practice, 3(2), 59-64.